Giant Kokopu released in the Mangatawhiri and Waikokowai Streams. 200,000 plants planted – all grown at TOSSI nursery. Ten critically endangered Takahē have been released. Oi (grey-faced petrel) confirmed breeding. 20,000 plants planted – all grown at TOSSI nursery. Pateke released supported by Wetland Care NZ and Banrock Station Wines. North Island robin and whitehead released. Mangatawhiri Wetlands reinstated and planting commenced. Forty-four North Island brown kiwi released through the Bank of NZ Operation Nest Egg Program. Bellbirds colonise Tawharanui from Little Barrier (Hauturu). Forest and Green Geckos rescued from Northern Motorway and released at Tawharanui. Two helicopter bait drops target and effectively remove mammalian predators from the Sanctuary. "Big Plant" - first major planting organised by ARC and TOSSI. 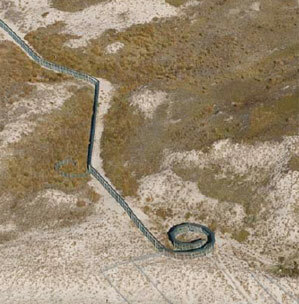 2.5 km Predator-proof fence completed at a cost of $625,000.